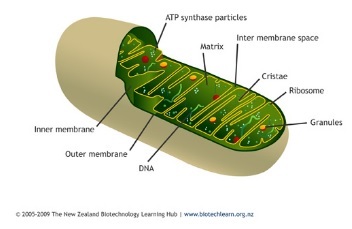 The mitochondrion has also been called the ‘powerhouse of the cell’ because it is the main site of respiration in the cell. Glycolysis is the precursor to respiration and it takes place in the cytoplasm of the cell, not the mitochondrion. The link reaction occurs in the matrix inside the mitochondrion, once pyruvate has been actively transported there following glycolysis. 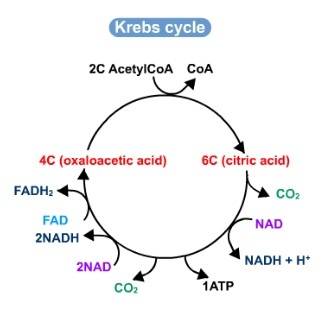 The Krebs cycle Occurs in the mitochondrial matrix. It is a series of enzyme-catalysed reactions that ultimately oxidise acetyl group of Acetyl CoA to 2 molecules of carbon dioxide. Anaerobic respiration is a type of respiration that takes place in the absence of oxygen. It produces a byproduct called lactic acid - which builds up in our muscles when we exercise for a long period of time, and makes them ache afterwards. 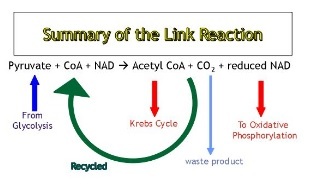 ATP yield is much lower in anaerobic respiration because the majority of it is formed in the oxidative phosphorylation - which requires oxygen as the final electron acceptor. Respiratory substrate = an organic substance that can be used for respiration.